Well, it has took a long time to get here, but we finally approach a conclusion to the 'Old Man Logan' arc. How long has this arc been going on? A year? The issues have been worth the wait, this has proved to be a real (out of continuity) treat. It is just the gaps between the issues have somewhat diminished the overall effect. Anyway - great issue, a bit of Red Skull, some other Marvel icons thrown in the mix, and a really gripping ending that you know has been coming, it is just how we were going to get there....Well, getting there was as satisfying as it could be really, and the last few panels are no doubt intended to get the fanboys out of their seats and cheering, salivating for the finale. 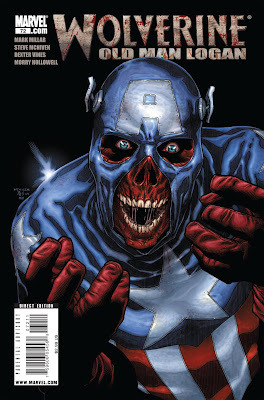 It is all very good, the Red Skull confrontation being a highlight. Verdict. Another great installment in a great series, mixing humour, self-reverence (of Marvel icons) and darker material. 8 out of 10.